The beginning of a new month means another chance to trade Uncle Sam’s non-farm payrolls (NFP) report! Here’s what you need to know if you’re trading the release on tomorrow at 2:30 pm GMT. The latest numbers reflected a net of 312,000 gaining jobs in December, which is A LOT better than the 179,000 figure that many had expected and marks the strongest increase since February 2018. Other factors that made the report sweeter was the increase in participation rate and hourly earnings posting its strongest year-end growth in more than a decade. Unemployment rate ticked higher, however. Overall, traders were impressed, but not too impressed. 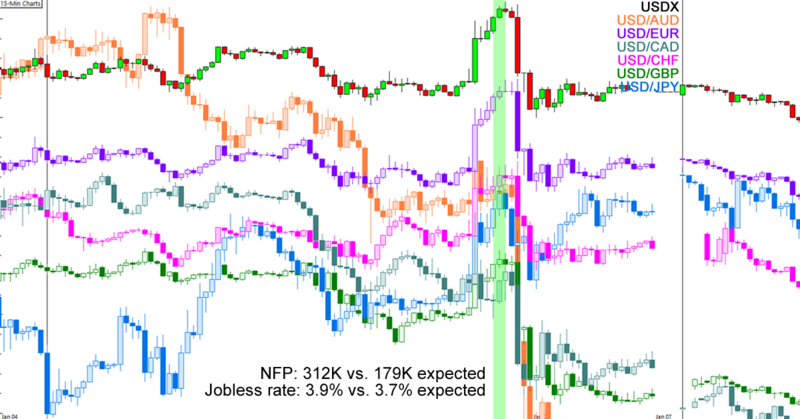 For one thing, the strong NFP numbers came a day after the closely-watched ISM manufacturing report came in weak enough to inspire recessionary fears across the board. And then there’s the uncertainty around the Fed’s policies. Last we had heard from Powell and his then was that they’re still planning on raising their rates in 2019. With strong labor market numbers behind them, the Fed could’ve kept on raising rates even as markets worried about downside economic risks such as the government shutdown, the U.S.-China trade war, and global growth slowdown. So, while the dollar climbed higher before and at the report’s release, it also gave up most of its post-event gains near the end of the day. Market players are expecting the headline NFP figure to take a chill pill and print at around 165,000 after last month’s jump to 312,000. Ditto for the monthly average hourly earnings, which is expected to post a 0.3% growth after December’s 0.4% uptick. Do leading indicators support these downgrades in expectations? Markit’s composite PMI showed the manufacturing sector gaining momentum in January, climbing from 53.8 to a two-month high of 54.9 as production expanded the fastest since May 2018. Meanwhile, yesterday’s ADP report brought dollar bulls to the yard when it showed a net addition of 213K, much higher than the 180K that many had expected and only a few points lower than December’s 263,000 figure. While the release isn’t exactly the most reliable predictor of NFP, its upside surprise still suggested sustained momentum for job creation in January. The more closely-watched ISM manufacturing and services PMIs are scheduled AFTER the NFP report is released, so we’re getting no help from those prints this time. Nothing much. Based on the charts below, analysts tend to overestimate the unemployment rate AND the headline NFP figure about as often as they underestimate the actual figures in January. We might as well flip a coin! Past releases aren’t much help either. While January’s unemployment rates have showed lower figures against December’s in five out of the last ten years, the odds are still not enough to inspire a bias. So, based on the leading indicators alone, it looks like we could see sustained momentum for improvements in the labor market despite gloomy signals from business and consumer confidence reports. Question is, will this week’s release even matter to the Fed and the markets? Recall that Fed head honcho Powell just admitted that the case for rate hikes has “weakened” as “cross-currents” like global economic slowdown and the government shutdown have muddied the Fed’s rate hike schedule. This, added to Powell sharing that “wages going up isn’t necessarily inflationary,” hints that this month’s release might not be as explosive to the dollar’s price action as it was in the previous months. That doesn’t mean that the event is a non-mover, though! For one thing, significant surprises in either direction for the headline NFP, jobless rate, and wage growth could influence consumer spending speculations. If the numbers are good enough, then traders just might get back to pricing in a more hawkish Fed!